Two police officers were recently charged with assault. The two pleaded guilty and were severely punished for infractions many officers get away with daily. All too often, police officers, while hunting down a suspect, will find the closest person to them and attack or arrest them. All too often they are wrong. Fitting the description, we are told, is how the officers justify the wholesale assault and kidnapping of an innocent person. As the following story details, even children are not safe from these violent mistakes. If someone wants to know just how seriously Canadians take police accountability, the following story serves as an indicator. Two Ontario police officers were charged and found guilty of tasering two individuals in a case of mistaken identity. Constable Kenny Belanger, a six-year-veteran of the Ontario Provincial Police, who worked out of the Kapuskasing detachment, pleaded guilty in the Ontario Court of Justice in Kapuskasing on Friday, to two counts of assault with a weapon. His co-accused, Acting Sgt. Daniel Lafontaine, a nine-year veteran of the OPP who worked out of the South Porcupine detachment, pleaded guilty to two counts of assault. Both Belanger and LaFontaine were arguably doing their jobs to track down a suspect, in her 20’s, who had stabbed a woman earlier in the day. As they were going house to house to locate the assailant, they came across a young man and his 15-year-old girlfriend. It just so happens the young girl had the same name as the suspect in her twenties, but that was the only similarity. As officers do in the continental U.S., they entered the residence without a warrant, and snatched up the young girl. It didn’t matter that she was too young to be the suspect, that she was holding an infant in her arms, or that both she and her boyfriend kept telling the police they had the wrong person. So disturbed was the boyfriend that he went upstairs to wake the girl’s uncle, who began to describe the girl had a heart condition, a fact her boyfriend may not have known. As both the uncle and the boyfriend approach officers again dispelling any notion she was the suspect, and declaring the teen had a heart condition, things took a turn for the worse. Officer Belanger, without issuing the mandatory warning that he was deploying his taser, zapped the boyfriend. The teenage girl was also zapped, even though officers were warned of her heart condition. While she was laying on the ground, officers took her photo and sent it to the stabbing victim, who promptly informed officers she was not the woman who stabbed her. Belanger apologized to the teen but then informed her she’d be arrested for “resisting arrest.” Does this story sound familiar to our TFTP readers? 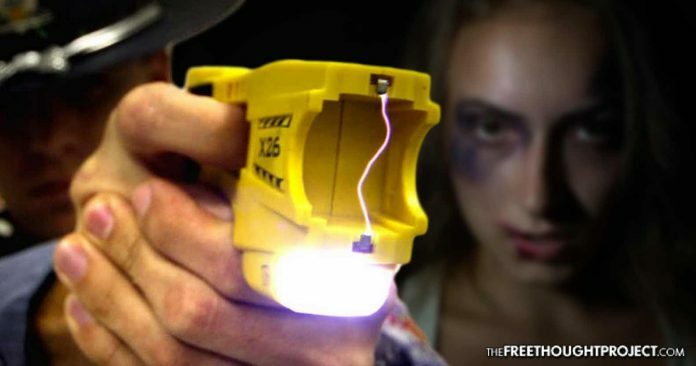 The number is astronomical as to how many times U.S. police deploy their tasers often with deadly results. As a result of the officers’ actions and being found guilty of assault in a court of law, the two Canadian officers were severely punished, even though it was only Belanger who deployed his taser. Belanger received a two-year suspended sentence with two years of probation, and was ordered to complete 240 hours of community service. He is also prohibited from possessing a firearm for the next five years. Lafontaine received a two-year suspended sentence with two years of probation, and was ordered to complete 180 hours of community service. It was also revealed in court that neither of the officers conducted a criminal records check in regards to the identity of the woman they were intending to arrest prior to the arrest of the male and female victims. Also neither of the officers asked the 15-year-old female for her identification nor was she informed of her rights during the arrest. The court heard the officers who grabbed the teen did not have a warrant to enter the premises, nor had not been invited into the house. It was also noted in court that both officers had falsified details in their notes and incident reports in an attempt to mitigate any hint of wrongdoing on their part. We applaud the Canadian justice system for taking seriously the notion police officers should be held accountable for their unlawful actions. When police officers in the U.S. are accused of breaking the law and/or violating police department policy, all too often, police officers are investigated by their own fellow co-workers. Not surprisingly, the investigation concludes the officers did not violate the law or department policy and no disciplinary actions are taken. When officers are later sued in a court of law, it is the taxpayers, not the officers, who pay the settlement fees in civil rights litigation. We can only hope for the day when officers in the U.S. are held accountable for their unlawful actions.